Curly hair, especially if it is your natural one, can be so hard to maintain. Every curl works on its own, and sometimes not even good products and conditioners can help you. However, there are some haircuts that can tame your curls. One of them is unquestionably short bob. It is timeless, always fashionable, and impeccably easy to style. If you are having trouble styling your curls, check out these short bob ideas. Cute curls like this can be hard to style, we admit. However, if you opt for a short bob with slightly choppy ends, you can be sure that your locks will stay in place. Messy hairstyles are one of our favorites. You can wear them whenever you want and still be chic and fashionable. The factor wow is achieved with those curls – they look lovely. 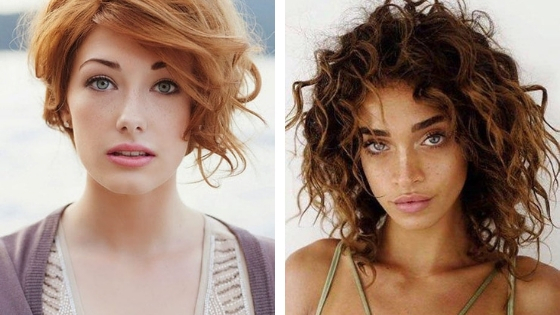 Layered bobs look great on both straight and curly hair. If you have waves or curls and you want to make them look really interesting, cut your hair short, in a layered bob and enjoy in results. Chocolate brown hair might be even more attractive than blonde. If you want to look interesting, and your hair eye-catching dye your hair in this lovely shade and make these relaxed waves. Lilac is not only the color of the season, but it looks perfect on your hair as well. If you are not sure about it, then dye just a few strands in this unusual but trendy hair color. Sometimes, when you have stunning hair color on your hair, you don’t need anything else. This shade of wine is really attractive. The only thing you can do is to do golden highlights. They will be even more visible with curls. While curly hair strands in front are longer, the ones in the back make this bob look exactly like that. Beach waves will make you want to run to the seaside immediately but, trust us, they are worth it. Auburn or ginger color is perfect for girls with fair skin complexion. When you add curls and bob to the equation, you get a fantastic hairstyle for everyday wear. We believe that natural curls are not so easy to style. Sometimes, they work on their own, and they can be tough to tame them. However, short bob can help you. Make sure it is straight, without any layers. Layered bobs are great to style and to wear for every day. This one is one of those classic shaggy haircuts that is easy, timeless, and most of all perfect for your curls. When you need something fun, yet super stylish, opt for this lovely haircut. It will highlight your tousled locks, making them a bit messy, yet eye-catching. Afro hair looks not only gorgeous, but it is not so easy to style. You need to tame down those curls, and sometimes it is possible with short haircuts only. That is why you should opt for a hairstyle like this.